A type of saw blade that looks like a TCT blade but it has ceramic and metal qualities. Used in saws designed for cutting sheet steel. That is metal roof sheeting. Steel used to make metal drill bits,saw blade etc. Shortened to HSS. The fine metal shavings and dust caused by drilling or sawing steel. The leftovers of the operation. 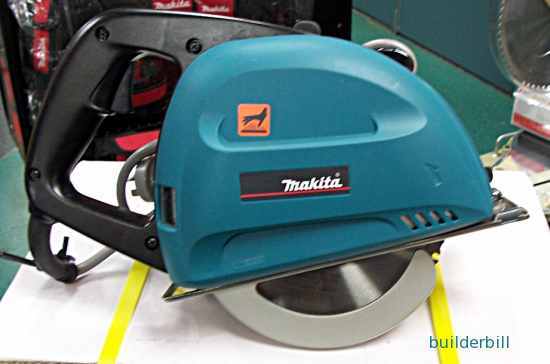 It is quite possible to cut sheet metal with a power saw using an abrasive disc or with a HSS blade, sometimes called a screech-er because of the piercing noise it makes. Both have significant drawbacks for roof cladding. One being that they generate lots of heat that burns the coating on the cladding close to the cut, and the other being that they spread swarf over surfaces that should remain clean and free of it. (Swarf that is left on a metal roof will rust very quickly and that rust can and does spread to the coated steel roofing. One answer to this problem is the Makita 185mm Cold Metal Cutting Saw above. I saw this saw at my local power tool shop and they gave me the details. I wish I could have got my hands on one of these when I was fixing roofing and cladding. We didn't use friction saws but used nibblers or plain hand snips which was fairly tedious and time consuming. Here are a few facts from Makita's web site. Burr-free cuts through metal. Cuts 75% quicker than abrasive cutters. Virtually spark free cuts, up to 6mm thick mild steel. Heavy duty blade cover for efficient swarf collection and operator safety. Thumb operated lever for blade guard retraction for ease of use. Stainless steel base plate for stability and durability. The bulky metal guard is a container similar to the dust catchers on their dustless circular saw that is made for cutting 4 and 6mm compressed cement sheets. This catcher collects the swarf. I have not seen one of these on a job so I don't know how efficient they are but it sounds as though it does the job. 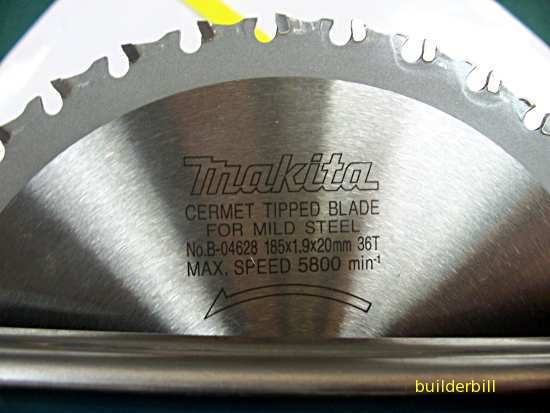 The blade in the saw is tipped with a ceramic meta compound and It Is claimed by the manufacturers that these cermet tipped blades cut down the amount of heat generated in the cutting process.